Any young birders or students interested in birds and nature who are enrolled in pre-K, grade school, middle school or high school can download the new version 7.7 of Thayer’s Birds of North America – for FREE. Just visit www.ThayerBirding.com, select the Windows or the Mac download and enter our special code: xxxxYoungBirder. Then click the Apply button and Free Checkout. This amazing birding software, for Windows or Mac computers, features the 1,007 birds that have been seen in the continental United States and Canada. The software includes 6,856 color photos, 1,506 songs and calls, 552 video clips of birds in action, 700 quizzes and much, much more. Use the ID Wizard to identify unknown birds in your yard. Keep track of the birds you see. Compare any two birds side-by-side. Read all about the bird’s nests, eggs, feeding habits and more. Thayer Birding Software’s founder, Peter Thayer, decided that this would be the perfect way to celebrate his 70th birthday! Are you the local bird expert? You soon will be! College and grad school students, use the code STUDENT for a 50% discount. Teachers use the code TEACHER for a 50% discount. Peninsula Point Lighthouse at the tip of the Stonington Peninsula is one of the best locations in the UP to witness spring migration. Hundreds of neo-tropical songbirds like warblers, tanagers, orioles, grosbeaks, vireos, buntings and thrushes are readily found each year along with shorter distance migrants like sparrows, jays, woodpeckers, chickadees and finches. On a good day, a birder can easily tally over 100 species including over 20 species of warblers. Carpooling: Please make your own arrangements for rides. Driving Instructions: From US Highway 2 proceed 2.8 miles east from Rapid River; take the exit towards Stonington and travel south on County Road 513. Follow CR 513 for 17.7 miles to the tip of the peninsula, where you will find the Peninsula Point Lighthouse. Some highlights from past field trips include both Summer and Western Tanagers, Hooded Warblers, Connecticut Warblers, Rose Breasted Grosbeaks, Indigo Buntings, egrets, swans, terns, yellowlegs, and hundreds of Whimbrels. Join us for some of the spring’s best birding. A bonus of this gathering is that there will be plenty of expert birders available to help with spotting and bird-identification. 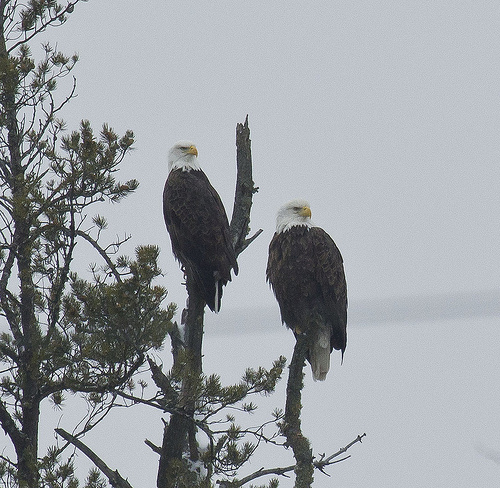 The 21st Gwinn Christmas Bird Count (CBC), held on January 3, yielded exactly 1000 birds of 28 species. Historically, the CBC was originally conducted for eight years from 1980 to 1987. In 2002, the count was resurrected, shifted to early January, and completed every year except for one since.During the 1980’s, the Gwinn CBC averaged 20 species annually. Since 2002, that average has increased to 25. Within this present series, 15 species have been recorded nearly every year. The average number of individual birds seen since 2002 is 940. The three most common species reported this year, Black-capped Chickadee (historical rank #1), Rock Pigeon (#3), and Blue Jay (#9), constituted 55% of all individual birds seen. As usual, no waterbirds were detected this year. Finches, while not at all numerous, were far more prevalent than last year. Six species were encountered, although goldfinches were drastically reduced from the record 505 birds in 2014. The last major local incursion of northern finches dates back to 2009. Of the 28 species found this CBC, 18 were more numerous than average. The greatest deviations above historical means occurred among Rock Pigeon, Blue Jay, and Brown Creeper. Species much less common than usual included Common Raven and American Goldfinch. Whereas Bald Eagles, Wild Turkeys, Red-bellied Woopeckers, and Cardinals continue to demonstrate local increases, Common Ravens and Evening Grosbeak have been steadily declining. 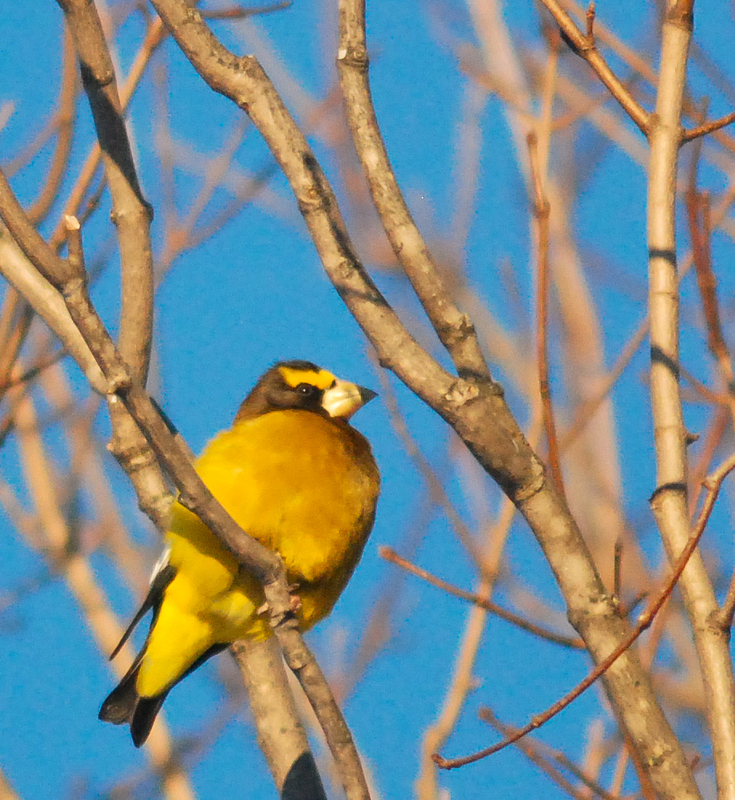 Evening Grosbeak – 24Thanks to the organizational efforts of Roger and Alice Harbin, we again had excellent participation this year. Feeder observers produced 305 birds of 18 species from 14 locations. Field observers, generating 695 birds of 25 species, comprised Beth Olsen, Debbie Hecox, Cliff Wooten, Alice Harbin, Roger Harbin, and myself. species. This ties our species count from the first year and is up from 21 recorded in 2013. We added two new species this time, Barred Owl and Pine Siskin, which brings us to a cumulative total of 34 species over the three years. American Goldfinch, and Evening Grosbeak were all recorded. We experienced relatively warm weather and calm winds on Saturday, Dec. 20, and general consensus was that because of the good weather, birds were not concentrated in the areas they would be in worse conditions: feeders and harbors. Overall bird numbers seemed low, but we ended up with a respectable 44 species, plus 5 more during count week. Notable species: Northern Pintail (count week, observed on Sunday at Dead River) is a new species for the count. Wood Duck has been observed on 3 of the past 4 Marquette counts, all at the Dead River. Merlin (count week, observed at Founder’s Landing on Monday) has been reported on 4 other counts. White-crowned Sparrow has been reported on 4 other counts. Two Northern Shrikes were seen at Cherry Creek and the Marquette compost yard. Three flocks of Bohemian waxwings were seen in Shiras Hills, Harbor View Dr., and Morgan Meadows. Also notable were Red-bellied Woodpeckers at 3 locations, a Belted Kingfisher at the Carp River in Negaunee twp., 1 each Coopers and Sharp-shinned Hawk, Glaucous, a Great black-backed and a Thayer’s gull. Thanks to all our participants, and especially Jeff Knoop who hosted our post-count gathering. Yesterday morning (8/9) I led a group of birders on a tour around the Bog Walk on Presque Isle in Marquette for the monthly walk sponsored by the Laughing Whitefish Audubon Society. We had great weather and a wonderful assortment of birds, with some signs that fall is upon us. Apparent family groups of Black-capped Chickadees, Eastern Bluebirds, and Red-winged Blackbirds were wandering throughout. And some species, such as Common Grackle and Black-throated Green Warbler, which had been abundant on my previous walks this summer, were conspicuously absent today. We also had the great fortune to view a couple Cape May Warblers foraging high in a Tamarack. Other highlights included a Merlin which made a pass directly over our heads to harass a couple American Goldfinches, a lone Tree Swallow which may be one of the last I see before they head south, excellent views of a group of five Eastern Bluebirds, and a very cooperative female-type Ruby-throated Hummingbird which perched in front of us for several minutes! Thanks to all the birds and birders who came out today, I look forward to next time, on September 13! Here’s a complete list of today’s birds. Welcome to the new website for the Laughing Whitefish Audubon Society! We are a local chapter of the Audubon Society serving Marquette and Alger Counties in Michigan’s Upper Peninsula. For more information, including the schedule of upcoming programs and events, see the tabs near the top of this page and watch this space for future updates!